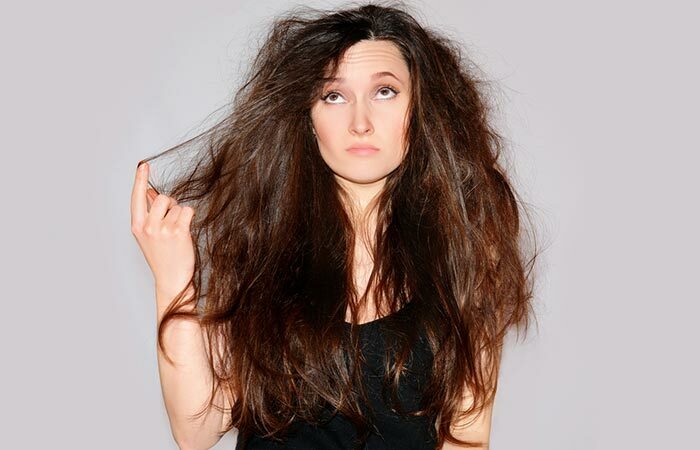 Before we get into what causes them, let’s answer a more important question – what are split ends? Strands of your hair begin to develop split ends when the hair cuticle (outer protective sheath) gets damaged and begins to wear off. This leads to the delicate inner layer of your hair to get exposed and weakened or dehydrated, which, in turn, causes split ends. Using too many styling products like gels, mousses, waxes, hair sprays, etc. Why Do You Need To Trim Split Ends? 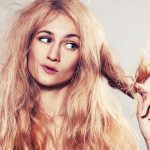 Split ends don’t go away on their own: Split ends don’t just magically fuse back together when you start conditioning or taking care of your hair. In fact, the longer you put off trimming them, the more each end splits into 2 or 3 “feathers.” This, in turn, seriously hinders your hair growth. Uneven pigmentation: The color of split ends is usually a bit lighter than your natural hair color. This can make your overall hair color look discolored and uneven. Robs your hair of its shine: Split ends rob your hair of its lively glow and make it look brittle, dull and lifeless. No amount of conditioning, hair masks, and spa treatments can restore the shine back in your hair unless you trim off the split ends. The easiest, quickest and most convenient way of getting rid of split ends is by trimming them off. Now, wait a minute! Before you rush off to set up an appointment with your hairdresser, hear me out. You can easily trim off split ends yourself in the comfort of your home! All you need is a pair of hair cutting scissors and you’re good to go! There are 3 different methods that you can try out to get rid of split ends. Let’s look at each of them step by step. Hair twisting is a traditional method of trimming split ends and is actually the method even professional hairdressers use! Start off with dry hair. Pick up a 1 inch section of hair and tightly twist it in a clockwise manner from the roots to tips. Hold this twisted section of hair taut at the ends. If you have twisted the hair tightly enough, you will see the split ends sticking out from the twisted section. Starting from the top of the section and working your way down, trim off these split ends that are sticking out. Now, re-twist this same section but in a counterclockwise direction and cut off the split ends in the same manner. Repeat this process throughout all your hair. Hair sliding is a more unconventional method that not many people know about. This is probably because it requires a little more effort as you have to straighten your hair before you cut off the split ends. Use a wide toothed comb to remove all the knots and tangles from your hair. Pick up a 1 inch section of hair. Starting at the roots, weave this section of your hair under your index finger, over your middle finger, and under your ring finger. Thus, you will see your hair only above your middle finger. Thanks to this weaving action, you will able to see the split ends sticking out above your middle finger. Snip off these split ends with the hair trimming scissors. With the hair still remaining woven through your fingers, slowly slide your fingers down the section of hair and trimming off the split ends in the same manner. Continue this sliding and trimming motion until you have reached the end of the section. Then, just follow this same procedure all over your hair. If you don’t have the time (or the patience!) 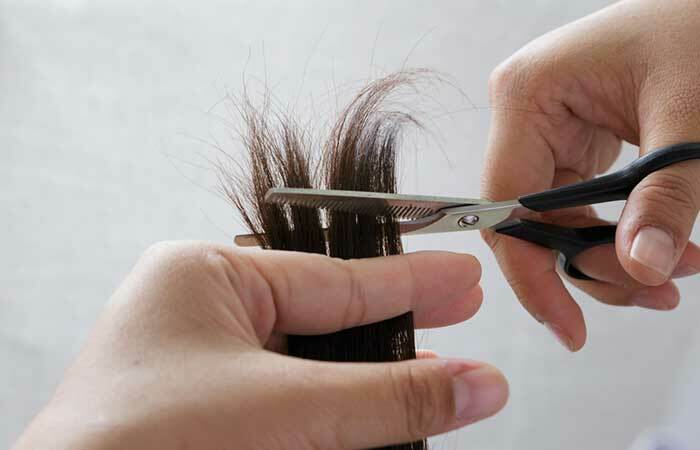 to follow the twisting and sliding methods, you can simply trim off the ends of your hair to get rid of the split ends. Start off with damp hair. You can do this immediately after you’ve stepped out of the shower or dampen your hair with the hair help of a spray bottle. Pick up a 1 inch section of hair. You can clip up the rest of your hair to keep it out of the way. Place this section of hair between your index finger and middle finger right at the roots. With the hair held taut between your fingers, slide your fingers down until you’re an inch away from the ends. Hold the section this way out in front of you. 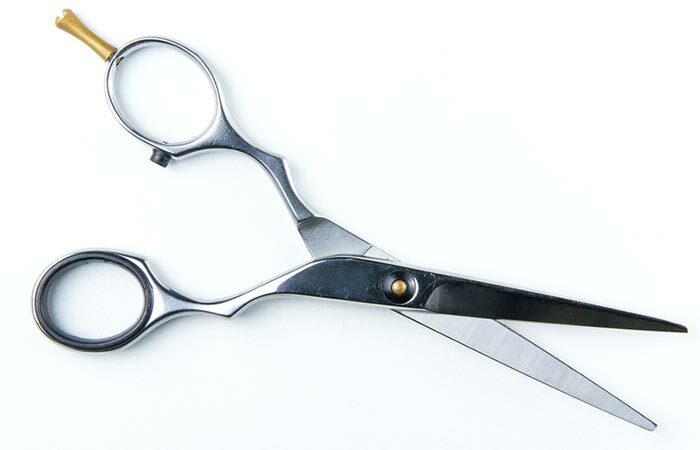 Keeping the scissors perpendicular to the hair, carefully cut off 1-2 inches off your hair. Trim off the ends of all your hair following this same procedure. While it is fairly easy to snip off your split ends, you need to know that they are indication of the poor health of your hair. So it’s best that you start taking care of your hair and restoring it back to help prevent any split ends from developing in the future. Trim your hair regularly: Your hair goes through some wear and tear every time you wash and comb it – this causes split ends. So it’s best that you get your hair trimmed every 2-3 months. Oil your hair before you wash it: We all know that oiling your hair can nourish and moisturize it from within. But another way this helps your hair is by forming a protective sheath around it to reduce the damage caused when washing and shampooing it. Reduce use of heat styling tools: Regularly using heat styling tools like blow dryers, flat irons and curling wands robs your hair of its moisture and leaves it dry, brittle, and susceptible to split ends. So, avoid using them as much as you can, and when you do use them, make sure you apply a heat protectant to your hair first. Don’t wash your hair everyday and avoid using hot water: Doing either or both of these things can strip your hair of its natural oils and dehydrate and weaken it. 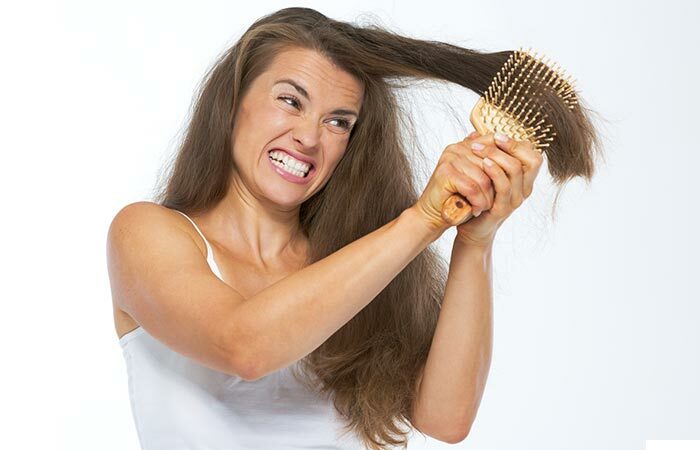 Dry your hair gently: Vigorously rubbing your wet hair with a towel can cause intense damage and split ends. Instead, wrap your hair in a microfiber towel until it has absorbed all the excess water and let it air dry the rest of the way. 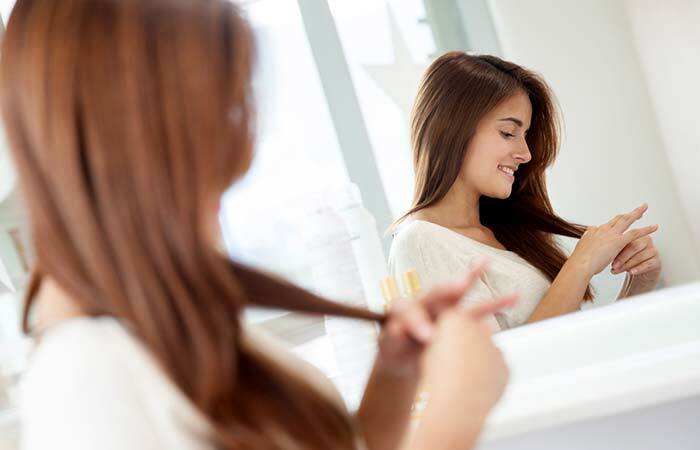 Apply a leave-in conditioner: Leave-in conditioners make your hair more manageable and easier to detangle, thus reducing the risk of split ends. So, apply a leave-in conditioner (or a bit of natural oil) after you step out of the shower. Use a wide toothed comb: Use a wide toothed comb and work your way up from the ends towards your scalp to prevent further knotting, breakage, and split ends. 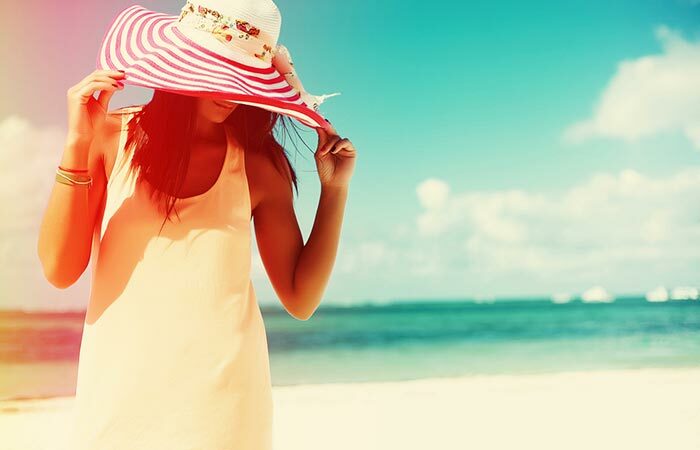 Wear a hat/scarf while stepping out: Leaving your hair exposed to the hot sun or cold winds can make it brittle and more prone to split ends. So, make sure you put on a hat or wrap a scarf around your head to protect your hair while making a cool fashion statement. Deep condition regularly: It’s important that you deep condition your hair every 2 weeks to restore moisture into your hair and nourish it from within. Use products that contain PEC: PEC or Polyelectrolyte Complex is a new component that has been found to repair split ends by penetrating the hair shaft and sealing it from within. So, pick a conditioner that contains PEC if you want to fix split ends as well as prevent them from forming. 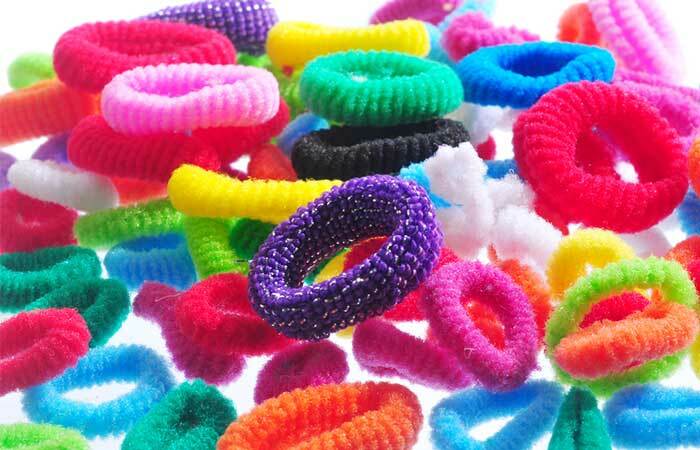 Use soft hair ties: Rubber hair ties or ones that have a metal clasp in the middle tend to break your hair and ultimately lead to split ends. So, use soft hair ties that are gentle on your hair. Oil your hair before swimming: Swimming regularly in harsh chlorine-infused water can cause untold damage to your hair. So, apply a protective layer of coconut oil all over your hair and put on a swim cap before you jump into the pool. Eat a balanced diet, and drink lots of water: Eating a balanced diet full of proteins, vitamins, and minerals and keeping your body well hydrated is essential for maintaining the health of your hair. 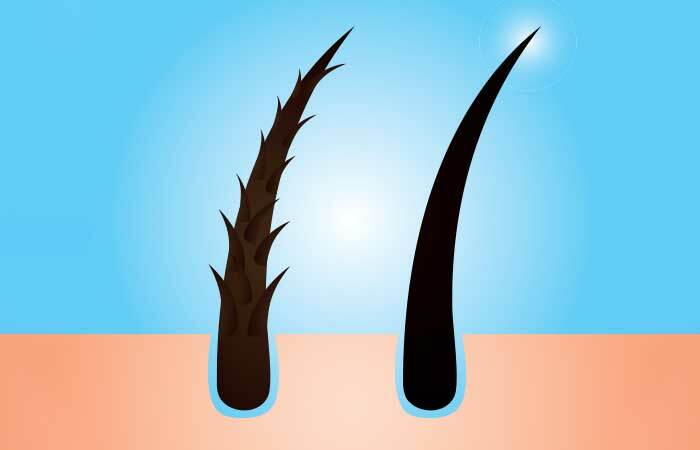 Split ends can be extremely unsightly to look at. But that doesn’t mean that you can’t get rid of them. Trim off your split ends with the help of the instructions we’ve given you and comment below to let us know how it worked out for you! What can happen if you don’t cut your split ends? Your hair can look dull and dry and your hair growth can slow down if you don’t cut your split ends. Is it better to cut your hair when it’s wet or dry? It’s better to cut straight hair when it’s wet and curly hair when it’s dry. 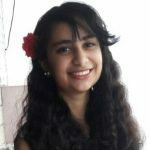 Do split ends slow down hair growth? 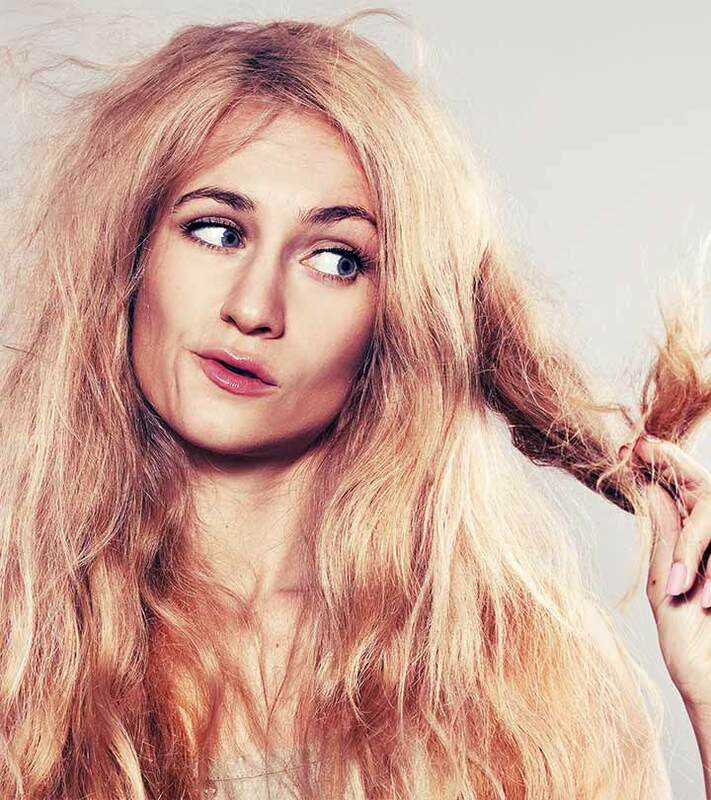 Yes, split ends do slow down hair growth. Struggling with split ends? Split ends preventing you from keeping long hair? Try out these treating, preventing and removing split ends. Everyone dreams of having flawless, flowing hair! But if you are a hair-obsessed person who actually has no time for hair care, smoothing will work like a genie in a bottle for you!